*That's more often rendered, by Powell's nephew, Ferdinand Mount, as well as by Christopher Hitchens, as Powell expressing interest in a hypothetical Burke's of Bank Clerks , a more entertaining formulation. Notes to "Anthony Powell on Aubrey, far from 'bloody boring.'" an unhappy, unhealthy, malicious, frustrated old man; but one to whom all 'pretenders to antiquity' owe a great debt. . . . He was not, on the whole, an attractive figure, but he did not lack qualities of courage and perseverance. . . . Aubrey had found in him something that was intensely sympathetic, and Wood is yet another instance in the strange annals of friendship of the unlikely human beings who can inspire deep affection. Notes to "In a movie theater at least you can hold hands." * I've had to at least consider Walt Whitman for the title of Least Desirable Literature Professor. It would be sort of like studying combat--or, worse, willpower--with the Batman. What is he going to say, "Just do like I do"? * A note to the volume points out that Stevenson mistakenly dated the letter 1891, for which James gently corrected him, writing to "My dear distant Louis" that he envied "my time-deluded islander" for being "so luxuriously 'out'." ** I'm looking at you, Stieg Larsson. *** All these seem right to me except Conrad. Am I forgetting scenes of humor in Conrad? Lord knows, I've not read nearly all his books, but what comes to mind is a grim determination verging on dourness. Am I missing something? *Wait--there are published notebooks of Hardy? Yes, yes, it turns out that there are. I'll be getting those. 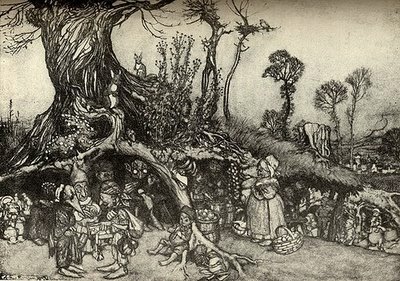 * How pleasing that the man who--though in this paragraph simply credited with naming the wildwood--was one of the scientists who placed the forest's clearance much earlier than generally thought shares a name with Arthur Rackham, one of the greatest illustrators of the creatures of forest, fairie, and fantasy! Most of what I do with my time is read, and that's what fuels this blog. I'm the editor of The Getaway Car: A Donald Westlake Nonfiction Miscellany, which will be published by my employer, the University of Chicago Press, on October 1. That said, this blog is entirely separate from my job. I do sometimes write about books published by my employer without specifically drawing the connection, but if you're a regular reader, I figure you know my tastes well enough by now to trust me. If you're new here, you're welcome to take a look at the archives and decide for yourself. I have served as the poetry editor for the Quarterly Conversation, and I've written for the Poetry Foundation, the Chicago Reader, the Second Pass, the Bloomsbury Review, the Front Table, the New-York Ghost, the New York Moon, and McSweeneys Internet Tendency.